Leave it to Austin to have the most hipster ice cream spot imaginable. 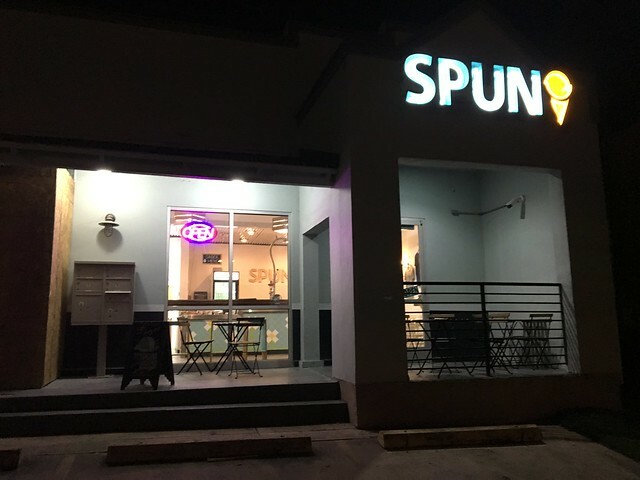 SPUN Ice Cream is a locally grown ice cream shop cofounded by two sisters from Austin, Texas. 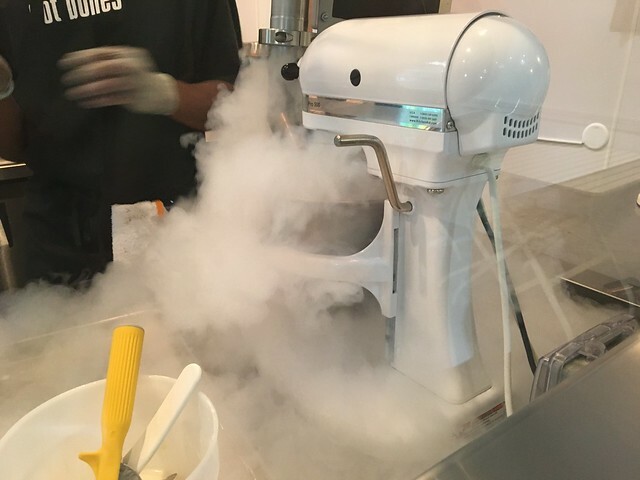 We specialize in fresh, seasonal ice creams, spun to order using liquid nitrogen. All our handcrafted flavors and “pairings” are dreamed up and made from scratch, by Chef Christina Cheng. A craft ice cream experience from top to bottom, Chef Christina offers a rotating menu of house-made original pairings, such as chocolate waffle cones, Texas pecan brittle, corn cookie crumble, citrus confetti, pickled jalapeño glass, and caramel popcorn sprinkles (ABOUT). 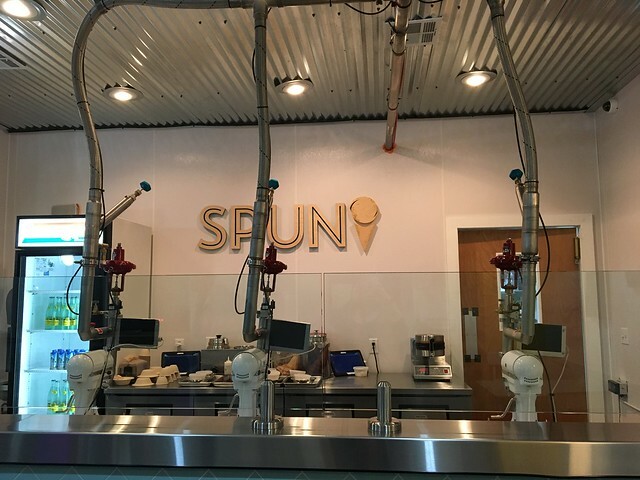 Spun Ice Cream is a delicious little spot in an up-and-coming area of Austin that makes ice cream with liquid nitrogen. At negative 321°F (that’s more than five times colder than Barton Springs), liquid nitrogen helps us deliver a velvety smooth, creamy texture without the need for added milkfat. Plus, some food science experts say flash freezing preserves the nutrients in foods better. We go from raw ingredients to finished product in minutes right before your eyes (ABOUT). The menu items change often, but the Butter Pecan special had my name written all over it. 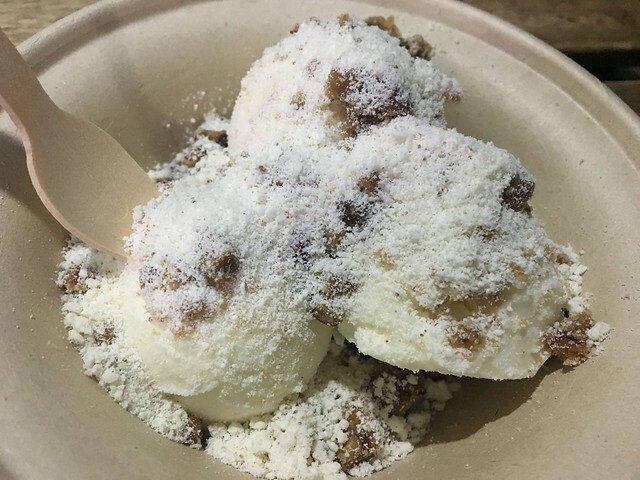 IT was made with sweet cream ice cream, pecan praline and brown butter powder. Chef Christina's flavors and pairings menus shift seasonally and include local and organic ingredients as often as possible, which include organic spices and fair trade chocolate. All our ice cream bases are made in-house with fresh milk and cream (from Texan cows free of antibiotics, hormones, GMOs, corn and soy). We don’t add any emulsifiers, preservatives or stabilizers to our ice creams – just sugar and spice and everything ice. 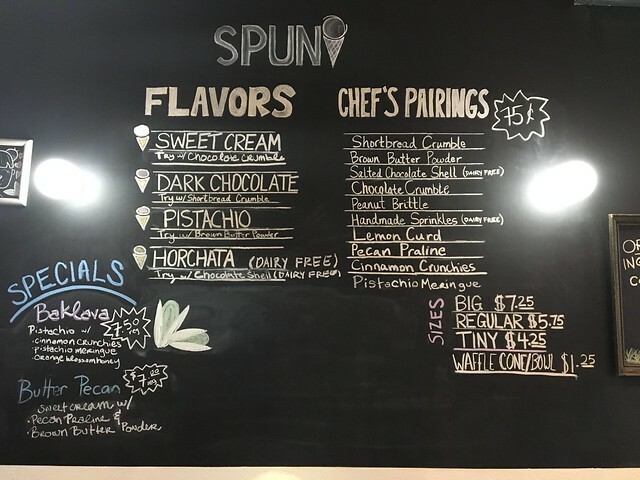 Check our shop blackboard for the most up to date menu and list of local and organic ingredients we're cooking up in the SPUN kitchen! We have a limited menu at the ice cream truck location (MENU). And, man, was it good. If there's a way to make ice cream even better, it's combining some texture - which this did SO well between the crunchy praline and soft powder. Rich, slightly salty and very sweet. Phenomenal.